MGM's (producer Sam Zimbalist) and director William Wyler's three and a half-hour long epic drama Ben-Hur (with a spectacular sea battle and eleven minute chariot race choreographed by Yakima Canutt) broke the previous year's all-time record of Gigi (1958). 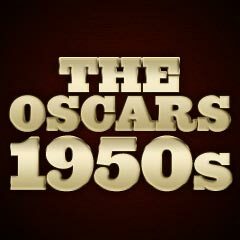 It was the most-honored motion picture in Academy Awards history up to that time and for many years - until 1997, with its record-breaking eleven Oscars from twelve nominations. And it was the most expensive film of its time, budgeted at $15 million. Ben-Hur was a re-make of MGM's own 1926 silent film of the same name, and the first and only re-make to have won the Best Picture award. Both films were based on or inspired by General Lew Wallace's novel (first published in 1880) about the rise of Christianity. Ironically, the famed director Cecil B. DeMille, who had made 'Ben-Hur-like' films throughout his lifetime - without the same awards success as the 1959 winner, died the same year (on January 21, 1959). Four of the five Best Picture nominees were also Best Director-nominated. Billy Wilder's signature film Some Like It Hot (with six nominations and one win - Best B/W Costume Design) about two unemployed musicians who disguise themselves as women in an all-girl band to escape gangsters, supplanted Best Picture-nominated Anatomy of a Murder as the fifth director-nominated film. British actress Hermione Baddeley (with her sole nomination) was nominated for Best Supporting Actress as music-teacher Elspeth (Simone Signoret's knowing friend). 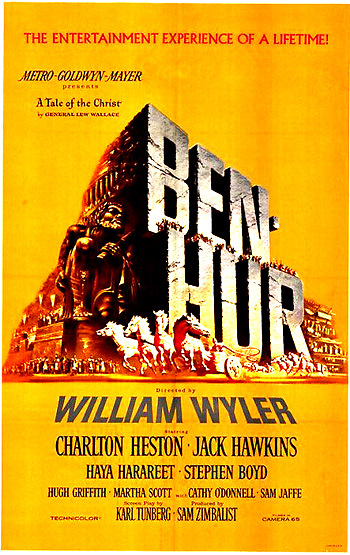 The Best Actor winner was Charlton Heston in the title role of Ben-Hur as Judah Ben-Hur - a rich patrician Jew who is denounced as a traitor by former childhood friend and Roman commander Messala (Stephen Boyd) and sentenced to life as a Roman galley slave, while his mother and sister are sent to a leper colony. Reprieved after saving the life of a Roman commander, Ben-Hur returns to seek bitter revenge in the chariot race. It was Heston's only nomination and sole win in his long, distinguished film career in which he usually portrayed historical characters. Heston's win marked the first time a performer received an Oscar for a Biblical film role, possibly the result of block voting for the Best Picture winner. An Honorary Oscar, a bittersweet recognition, was awarded to the under-appreciated Buster Keaton, one of the silent screen's greatest comedic characters, who was known as 'The Great Stone Face.' His award was for "his unique talents which brought immortal comedies to the screen," such as Sherlock, Jr. (1924), The Navigator (1924), The General (1927), Steamboat Bill, Jr. (1928), and The Cameraman (1928). Francois Truffaut's "French New Wave" film and first feature film, the semi-autobiographical The 400 Blows (Fr.) (aka Les Quatre Cents Coups) received only a single Best Writing: Original Story and Screenplay nomination, but no nomination in the Foreign Language Film category (won by Black Orpheus). And Jean-Pierre Leaud's performance was snubbed as frustrated 12 year-old Parisian schoolboy and juvenile offender Antoine Doinel who was placed in a detention work camp - the film was famous for the ending (with a zoom and freeze-framed shot) in which the boy fled toward the beach and seashore. Similarly, Swedish director Ingmar Bergman's Wild Strawberries received only one nomination for Best Writing: Story and Screenplay. Unbelievably, both films lost their sole nominations to Pillow Talk. Because of the sweep by Ben-Hur, many other films were bypassed, including Hitchcock (again! ), for another MGM film - the definitive caper film North By Northwest. Although the film had three minor nominations, it was ignored in the Best Picture, Best Director, and all acting categories. Cary Grant, playing a debonair Roger Thornhill - a Manhattan ad executive and the victim of mistaken identity (believed to be a secret agent), the cool Eva Marie Saint, villain James Mason, Jessie Royce Landis in a supporting role as Grant's mother Clara, and the score by Bernard Herrmann were seriously ignored by the Academy. Stephen Boyd deserved a Best Actor or Supporting Actor nomination for his role as Messala (when compared to Hugh Griffith's nomination/win as Best Supporting Actor). And Howard Hawks' outstanding Rio Bravo with John Wayne as sheriff John T. Chance, Dean Martin as Dude, and Angie Dickinson as Feathers - the director's response to High Noon (1952) and similar in its cast composition to Red River (1948), received no nominations! And Lee Remick was un-nominated for her role as slutty, allegedly-raped Laura Manion (wife of Army Lieutenant Ben Gazzara) in the oft-nominated but completely bypassed Anatomy of a Murder. Ingmar Bergman's Wild Strawberries (1957), considered for awards in 1959, received only one unsuccessful nomination for Best Original Screenplay (Bergman). Both Bergman and Victor Sjostrom were snubbed as Best Director and Best Actor (as Professor Borg) respectively.